How likely is the NSA PRISM program to catch a terrorist? Recent revelations about PRISM, the NSA’s massive program of surveillance of civilian communications have caused quite a stir. And rightfully so, as it appears that the agency has been granted warrantless direct access to just about any form of digital communication engaged in by American citizens, and that their access to such data has been growing significantly over the past few years. Some may argue that there is a necessary trade-off between civil liberties and public safety, and that others should just quit their whining. Lets take a look at this proposition (not the whining part). Specifically, let’s ask: how much benefit, in terms of thwarted would-be attacks, does this level of surveillance confer? Lets start by recognizing that terrorism is extremely rare. So the probability that an individual under surveillance (and now everyone is under surveillance) is also a terrorist is also extremely low. Lets also assume that the neck-beards at the NSA are fairly clever, if exceptionally creepy. We assume that they have devised an algorithm that can detect ‘terrorist communications’ (as opposed to, for instance, pizza orders) with 99% accuracy. P(bad guy | +) =?? Further, lets say that the spooks have a pretty good algorithm that only comes up falsely positive (ie when the person under surveillance is a good guy) one in one hundred times. That is, for every positive (the NSA calls these ‘reports’) there is only a 1 in 10,102 chance (using our rough assumptions) that they’ve found a real bad guy. UPDATE: While former NSA analyst turned whistle blower William Binney thinks this is a plausible estimate, the point here is not that this is the ‘correct probability‘ involved (remember that we based our calculations on very rough assumptions). The take away message is simply that whenever the rate of an event of interest is extremely low, even a very accurate test will fail very often. UPDATE 2: The Wall Street Journal’s Numbers Guy has written a piece on this in which several statisticians and security experts respond. UPDATE 3: If you can read German, a reader reached me to point out that Der Spiegel technology section picked up the story. Big brother is always watching, but he’s still got a needle in a haystack problem. The television series doesn’t have this problem. On the show, they’re all bad guys. When making a statement of the form “1/2 is the correct probability that this coin will land tails”, there are a few things which are left unsaid, but which are typically implied. The statement is one about the probability of an unknown event occurring, and it would seem reasonable to write this statement using probability notation as P(toss=tails) = 0.5. And indeed many people would express it this way. However, what is missing is the state of knowledge under which this statement has been made. For instance, is the coin yet to be flipped, or is it currently rolling in a circle on the table, leaning in toward its final resting position? Perhaps the flipping device can consistently throw a coin such that it rotates exactly 5 times in the air before landing flat on the table, or we know which side is up at the start of the flip. In these latter cases, the statement of probability would be made under considerably more knowledge than the first, and would not tend to be 0.5 in these cases. An observer placing a probability of P(toss=tails) = 0.99 at the moment when the coin is circling in on its resting position, leaning heavily toward a tails up configuration, could be said to have the correct probability also. For fairness, lets say that the first observer also makes her probability statement at the same moment, but from another room where she cannot see what has happened. How can P(toss=tails) = 0.5, and P(toss=tails) = 0.99 be simultaneously correct? In practice, however, we often leave out the conditional part of the notation unless it is germane to the problem at hand. However, there is no such thing as unconditional probability. In fact, Harvard professor Joe Blitzstein calls conditioning the Soul of Statistics. In the next post in this series, we’ll start looking at how to assess the correctness of a (conditional) probability statement after having observed an outcome. 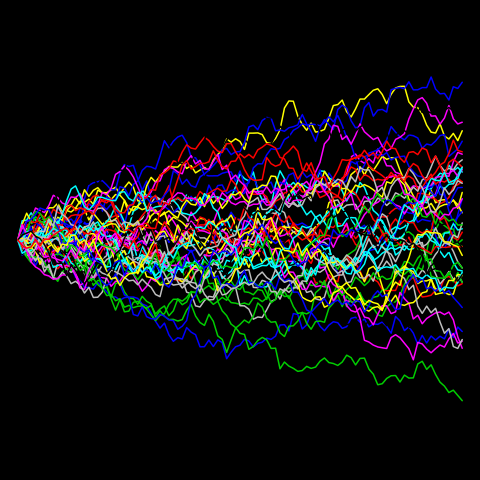 Here’s a bunch of random walks — just ’cause its neat. Where the area under the curve (the curve itself is the Receiver Operator Curve (ROC)) is some value between 0 and 1. The higher this value, the better your model is said to perform. 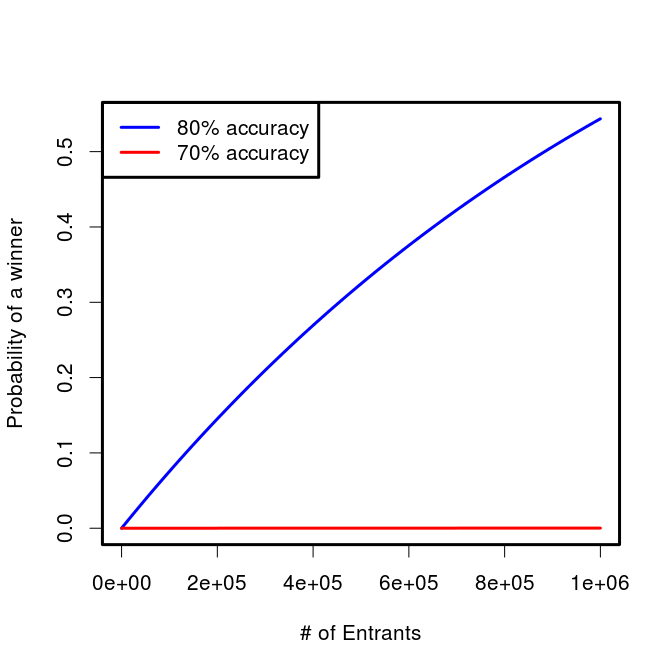 The problem with this metric, as many authors have pointed out, is that a model can perform very well in terms of AUC, but be completely miscalibrated in terms of the actual probabilities placed on each outcome. 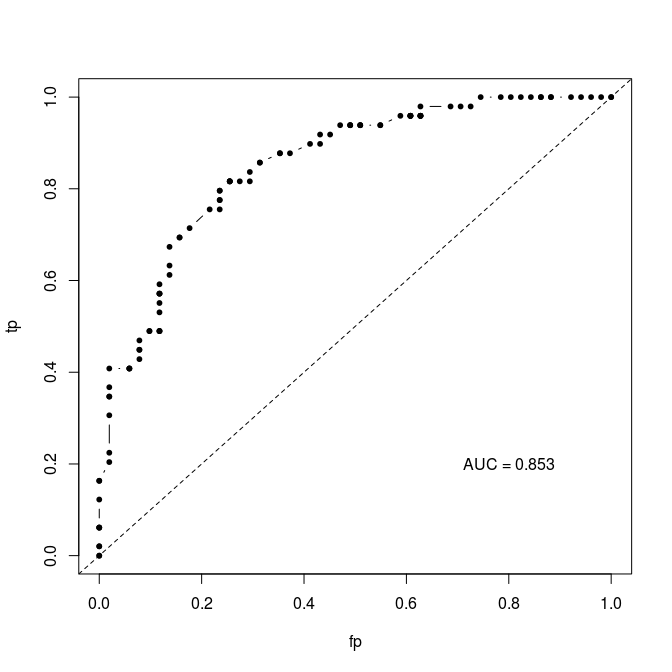 A model which distinguishes perfectly between positive and negative cases (AUC=1) by placing a probability of 0.01 on positive cases and 0.001 on negative cases may be very far off in terms of the actual probability of a positive case. For instance, positive cases may actually occur with probability 0.6 and negative cases with 0.2. 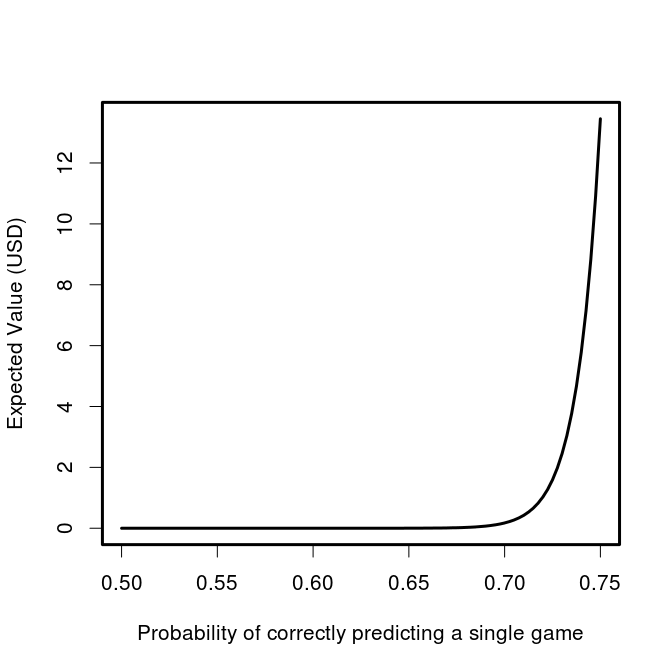 In most real situations, our models will predict a whole range of different probabilities with a unique prediction for each data point, but the general idea remains. If your goal is simply to distinguish between cases, you may not care whether the probabilities are not correct. However, if your model is purporting to quantify risk then you very much want to know if you are placing the probabilistically true predictions on cases that are yet to be observed. Which begs the question: What is probabilistic truth? This questions appears, at least at first, to be rather simple. A frequentist definition would say that the probability is correct, or true, if the predicted probability is equal to the long run outcomes. Think of a dice rolled over and over counting the number of times a one is rolled. We would compare this frequency to our predicted probability of rolling a one (1/6 for a fair six-sided die) and would say that our predicted probability was true if this frequency matched 1/6. But what about situations where we can’t re-run an experiment over and over again? 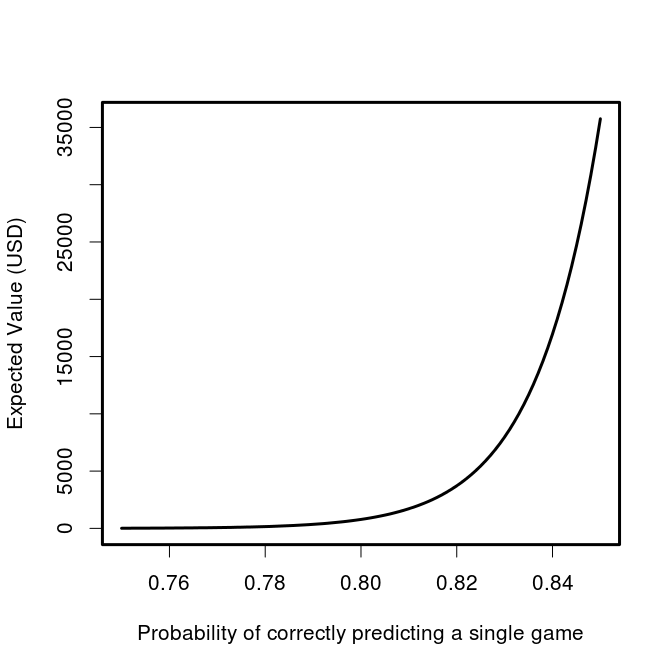 How then would we evaluate the probabilistic truth of our predictions? I’ll be working through this problem in a series of posts in the coming weeks. Stay tuned! I’ve been showing my new favourite toys to just about anyone foolish enough to actually engage me in conversation. I described how my shiny new set of non-transitive dice work here, complete with a map showing all the relevant probabilities. All was neat and tidy and wonderful until fellow ecologist, Aaron Ball, tried to burst my bubble. Nope. I couldn’t find the error. Fortunately, he works across the hall so I just went and asked him. The problem he found, it turns out, was not with my calculations but with my assumptions. Aaron told me that dice constructed with rounded corners and hollowed out pips for the numbers on the faces tend to be biased in the frequency at which each face rolls up. 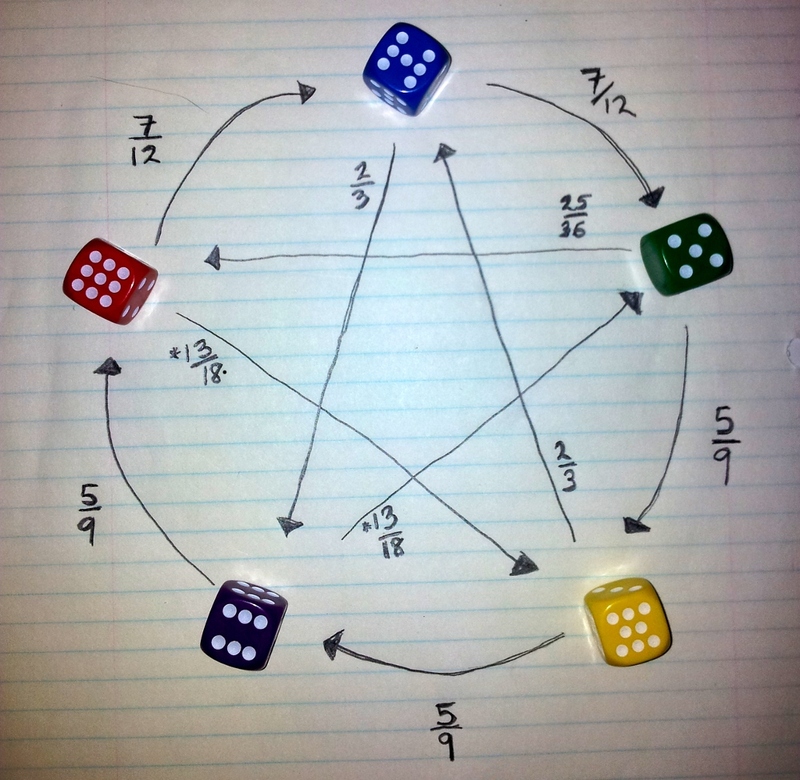 I had assumed, of course, that each side of each of the five dice would roll with the same probability (ie. 1 in 6). As with any model of a real world system, the mathematics were carried out on a simplified abstraction of the system being modelled. There are always, by necessity, assumptions being made. The important thing is to make these assumptions as explicit as possible and, where possible, to test the robustness of the model predictions to violations of the assumptions. Implicit to my calculations of the odds of the non-transitive Grime dice was the assumption that the dice are fair. To check the model for robustness to this assumption, we can relax it and find out if we still get the same behaviour. Specifically, we can ask here whether some sort of pip-and-rounded-corner-induced bias can lead to a change in the Grime dice non-transitive cycles. It seems a natural place to look would be between the dice pairings which have the closest to even odds. We can find out what level of bias would be required to switch the directionality of the odds (or at least erase the tendency for one die to roll higher than the other). Lets try looking at Magenta and Red, which under the fair dice assumption have odds p(Magenta > Red)=5/9. What kind of bias will change this relationship? The odds can be evened out by either Magenta rolling ones more often, or red rolling nine more often. The question is then, how much bias would there need to in the dice in order to even out the odds between Magenta and Red? Lets start with Red biasing toward rolling nine more often (recall that nine appears on only one face). Under the fair dice hypothesis, Red can roll nine (1/6 of the time) and win no matter what Magenta rolls, or by rolling four (5/6 of the time) and win when Magenta rolls one (1/3 of the time). P(Red > Magenta) = 1/6 + 5/6 * 1/3, which is 4/9. If we set this probability equal to 1/2, and replace the fraction of times that Red rolls nine with x, we can solve for the frequency needed to even the odds. Meaning that the Red die would have to be biased toward rolling nine with 2/9 odds. That’s equivalent to rolling a nine 1 and 1/3 times (33%) more often than you would expect if the die were fair! Alternatively, the other way the odds between Red and Magenta could be evened is if Magenta biased towards rolling ones more often. We can do the same kind of calculation as above to figure out how much bias would be needed. Which corresponds to Magenta having a 20% bias toward rolling ones. Of course, some combination of these biases could also be possible. I leave it to the reader to work out the other pairings, but from the Red-Magenta analysis we can see that even if the dice deviated quite a bit from the expected 1/6 probability for each side, the edge afforded to Magenta is retained. I couldn’t find any convincing evidence for the extent of bias caused by pipping and rounded corners but it seems unlikely that it would be strong enough to change the structure of the game.